The selection for the recruitment of Junior Data Entry Operator on contract basis consists of a written exam. The test date is finally announced. Odisha Staff Selection Commission will be conducting a written test for Computer Fundamental Theory of Jr. DEO (Home Department). Here you will get the updates of OSSC Jr. DEO Admit card 2017. So go through this page to download your admit card. The exam is scheduled on 16 April 2017 which is a Sunday. It is to be organized in 1 sitting only. 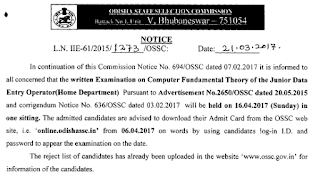 Admitted candidates are required to download their OSSC DEO Admit card from OSSC website online.odishassc.in. The hall ticket of OSSC DEO (Junior) will be available online from 06 April 2017 onwords. Candidates can get them using their login id and password. The reject list had already been uploaded on the site. The computer fundamental theory exam is of 40 marks and the duration is 40 minutes. The test in computer (practical) is of 30 minutes time and carrying 40 marks. Viva voce is of 20 marks.